Rappelling is just one of the sports involved in canyoning, or canyoneering, now available on Maui as a new way to experience the outdoors. While planning a trip to the Dominican Republic in the fall of 2005, Ken Schmitt came across canyoning, the sport of exploring canyons by hiking, climbing, swimming and rappelling. » Meet at: Park & Ride public parking lot in Kahului on Highway 380, about 200 yards south of Highway 350 (Puunene Avenue). Look for the Hike Maui van. » Cost: $150 per person (minimum age is 10), including gear (canyon shoes, harness, helmet and soft-shell jacket during cold weather); lunch of fruit, turkey, veggie burger or peanut butter and jelly sandwiches; bottled water; and round-trip transportation between Camp Maluhia and the pickup point in Kahului. Observers pay $100 to do all but the rappelling. Kamaaina discount is 10 percent. » Notes: Harnesses fit waist sizes from 22 to 54 inches; only those who fit them will be allowed on the tour. Minors under 18 must be accompanied by an adult. Wear shoes with traction and a swimsuit or board shorts beneath a T-shirt and long shorts or lightweight long pants. Bring a towel and change of clothes. Expect to walk over rugged, muddy terrain. It was the first time the Maui outdoors enthusiast had encountered that combination of activities in a single sport, and a light bulb clicked on in his head. "I knew immediately that it was something we should be doing in Hawaii, since our canyons are more spectacular than those in the Dominican Republic," Schmitt recalled. "I subsequently found out that canyoning -- or canyoneering, as it's known in the U.S. -- has been popular in Europe, New Zealand, Australia, Central America and the western part of the U.S. for a number of years." Schmitt had been running a successful tour company, Hike Maui, for more than 20 years. At the beginning of 2006, he decided to start a sister venture, Maui Canyon Adventures, to introduce canyoneering in Hawaii. Searching worldwide via the Internet for several months, Schmitt found Dave Black, a canyoneer with impressive credentials, to spearhead development of the program, site preparation, equipment selection and staff training. A former member of the American Canyoneering Association's board of directors, Black is an instructor of canyon guides and an examiner for the certification of canyon guides. He has been a professional canyoneering consultant throughout North America, Latin America, Asia, the Middle East and New Zealand; has authored three books on the sport; and has taught emergency medical technology certification and wilderness first-responder certification classes for many years. The two outdoorsmen scouted possible locations at the Boy Scouts of America's Camp Maluhia, 212 acres of breathtaking wilderness on a ridge between Waihee and Makamakaole Valleys in West Maui. Black mapped and wrote comprehensive operations and safety procedures for the sites, and marked emergency exits with GPS coordinates. Said Schmitt, "Maui has incredible canyons, and with Dave's help we're now able to offer everyone from the completely inexperienced city slicker to the developing extreme athlete the opportunity to explore them." 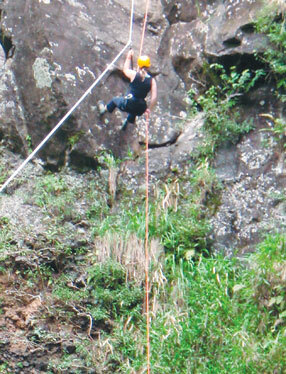 Maui Canyon Adventures launched Introduction to Canyoneering West Maui last September. "We've prepared a really fun program at Camp Maluhia that includes rappelling down 50- to 60-foot cliffs four times and swimming in waterfall-fed pools, one of which has a natural slide," said Schmitt. "When you're on the tour, all you have to do is follow instructions, use common sense and your athletic ability, and be prepared for a workout. We provide the brainpower, experience and equipment." Safety is the company's primary concern. To that end, Schmitt uses the best available anchors, ropes, helmets, shoes, harnesses and hardware. The gear is specially designed for the rigors of canyoneering and is thoroughly inspected on a regular basis. According to Schmitt, the tour's total hiking distance is about a mile with 700 feet of elevation change, and anyone in reasonably good physical condition can do it. Adventurers will enjoy the thrill of hiking up steep ridges, assisted by ropes affixed to trees; jumping off a 6-foot cliff into a picturesque pool; and climbing down and up a 15-foot rock face covered with banyan roots. "No ropes are needed because the roots are very strong and abundant," said Schmitt. 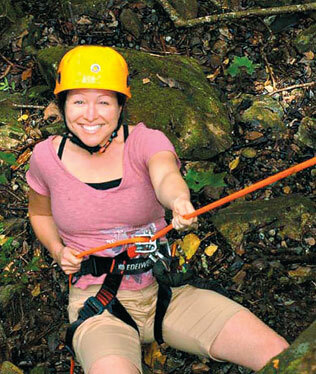 A highlight of the six-hour adventure is a "guided rappel," akin to a zip line but much steeper. You're hooked onto a taut overhead rope; the rappel rope attached to your harness controls your descent. From a perch above the treetops, you'll sail through the canopy to the canyon floor. There's a guide on the ground, holding the end of your rappel rope and backing you up, even stopping you if necessary. "Rappelling is easy to learn," said Schmitt, "and it gives you a new level of ability to explore and enjoy nature." He recalled a 25-year-old woman from Southern California who signed up for the tour knowing she had acrophobia, fear of heights. She had to pause to drum up enough courage to lean backward off the top of the cliff and trust the rope, harness and rappelling device to hold her. "It didn't take long for her to discover that if she fed the rope properly through the rappelling device, she could walk down the cliff backward without a problem," said Schmitt. "It gave her a tremendous feeling of self-confidence and exhilaration!" As humans have become urbanized, Schmitt believes we've distanced ourselves from the healing energies of Earth. "Today most people live in an almost completely artificial environment," he said. "We're like fish living in an aquarium instead of in streams, lakes or the ocean. We no longer know how the natural environment feels." The beauty, openness, thoughts and sensations he experiences when he's outdoors rejuvenate him. "I love the songs of birds and other creatures, the wind, rain, surf, fragrance of wildflowers, the full flavor of fruit I've picked off trees and put right into my mouth," he said. "I believe it's important to commune with nature in order to truly know what it means to be a human being on Planet Earth."